Tchaikovsky was responsible for five compositions which may be grouped under the heading of pieces d'occasion. These were, in order of composition, the Festival Overture on the Danish National Hymn, Op. 15, written in honour of the marriage of the Tsarevich to the Princess Dagmar of Denmark, the Festival Overture "1812", Op. 49, the Marche Slave, Op. 31, the Coronation March written for the crowning of Tsar Alexander III in 1883, and finally the Jurists' March of 1885, written to commemorate the jubilee of the St. Petersburg Law School. All these works have two things in common - each makes use of Alexis Feodorovich Lvov's great National Hymn "God preserve the Tsar", written in 1833, and each has constantly been subjected to the ridicule of the unintelligent critic who regards all music that is easily assimilated, clamorous and colourful as being unworthy of survival. 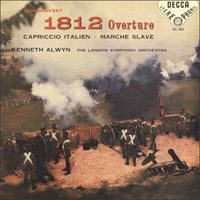 But in spite of this two of the pieces referred to above - the "1812" Overture and the Marche Slave - have remained popular items in the concert room. As the titles implies, the work is in the form of a free fantasia. The fanfare which opens the Capriccio was the bugle-call of the Italian Royal Cuirassiers, whose barracks adjoined the hotel where Tchaikovsky stayed in Rome; each morning he was awakened by this splendid sound. During the course of the piece no less than five separate tunes are introduced, the first two of which are heard more than once. The Capriccio, a masterpiece of orchestration, is scored for more than the usual complement of instruments: a third flute, cor anglais and two cornets are called for, and also harp and an array of percussion instruments. The London Symphony Orchestra. Kenneth Alwyn (conductor). Grenadier Guards. This was Kenneth Alwyn's gramophone debut. He shows a flair for Tchaikovsky rare in English conductors, and all three performances generate a real intensity and excitement. The climax to 1812 is really spectacular. The English conductor Kenneth Alwyn studied at the Royal Academy of Music, London from 1947 to 1950, his special subjects being piano, organ and viola. After taking the conductors' course at the Academy, he joined the Saddler's Wells Theatre Ballet as assistant conductor in September, 1952. Four years later he became a member of the senior company at Covent Garden, of which he was appointed associate conductor in June, 1957.